Originally published on Developing Green Communities. The fossil fuel industry has spent millions of dollars to keep themselves on the top of the energy game. 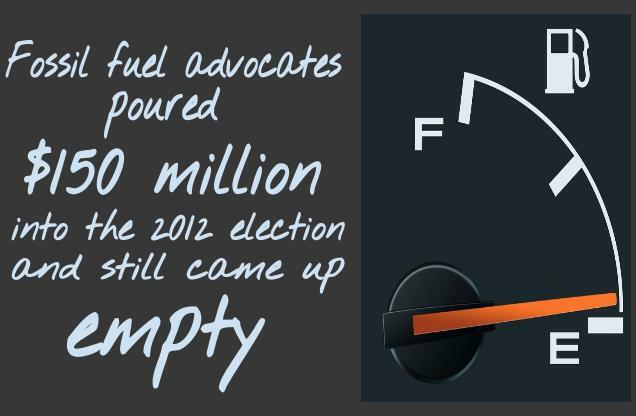 But Election 2012 proved that money does not buy you happiness- at least for the fossil fuels. According to this article on the Huffington Post, by mid-September, oil, gas and coal companies had spent more than $150 million on campaign ads. In one week alone, Texan oil barons donated $10 million to Governor Romney. At the current rate, by the end of the election- well over $200 million will be spent trying to put pro-fossil fuel politicians in office. Ohio– Senator Sherrod Brown ran on a record of supporting renewable energy and environmental protections and was re-elected for a second term. New Mexico– Martin Heinrich- a clean energy advocate, beat out Representative Heather Wilson- a pro- drilling, anti-climate action candidate for a Senate seat. Virginia– Governor Tim Kaine, with a proven record in favor of clean air and environmental standards, kept his seat despite fossil fuel companies pushing hard (financially) for his opponent. These advocates might have survived the onslaught from the fossil fuel lobby- but they aren’t the only clean energy advocates America put in office on Tuesday. Steve King and Tom Latham- both from Iowa, Dean Heller from Nevada and Dave Reichart from Washington all won re-election this year and all are big wind power advocates. So here we are- post election. Pro- clean energy and renewable energy advocates have prevailed. The voters have spoken and a majority want more renewable energy and environmental protection. We can all breath a sigh of relief. But there’s no time to rest on our laurels. Now the real work starts. This entry was posted in Renewable energy and tagged 2012 election, fossil fuel, politics. Bookmark the permalink.